Made another carrier, for good friend Simon. Some changes made from my original. I think I have a much better hatch grabbing arrangement at the bottom. Little forward pressure on the door panel but lots up vertical grip. 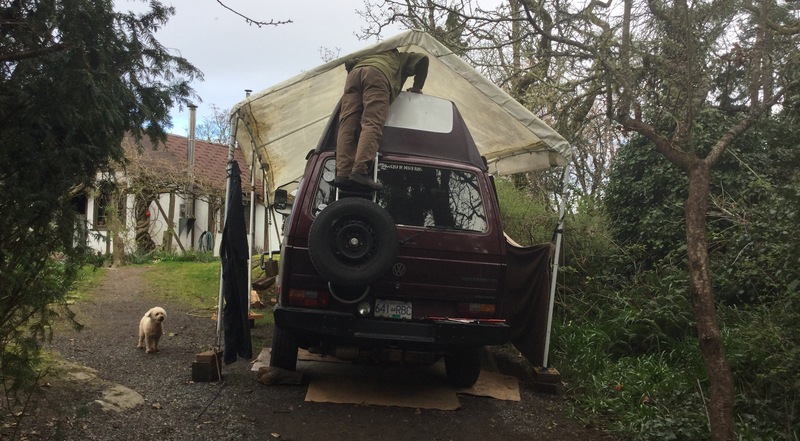 Tire is very solid to the ladder and the ladder very solid to the hatch. 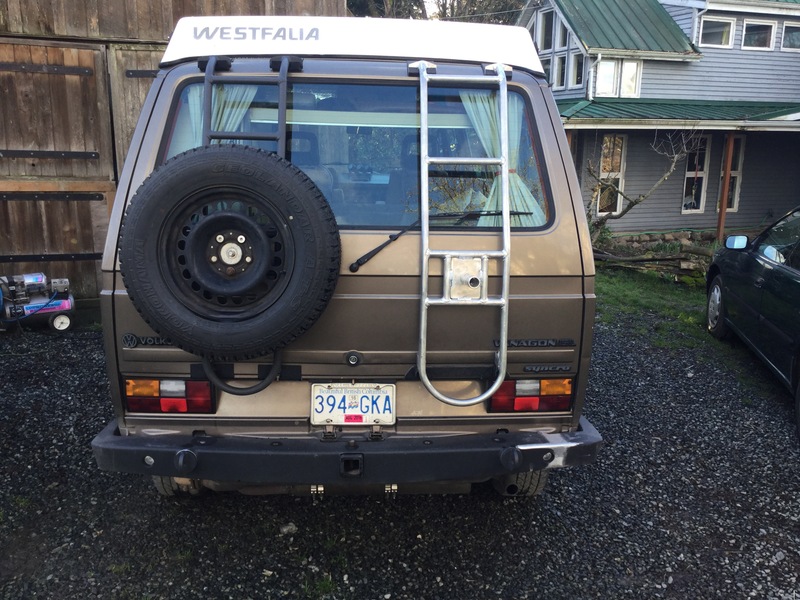 Also I repositioned the tire placement to be about 3″ lower than my original so less intrusion into the rear window. Having the tire on the hatch is a compromise. You do need to have special hatch struts to make opening the hatch an easy process. Simon has a pair of very beefy 1250 N struts that raise the landed hatch with no effort. The top hangers and the bottom grabber assembly is made from 0.120″ thick 316 stainless. Bolts are stainless. But the lug nuts and the mounting studs are steel. I’m going to make some more, with some further refinements. During the build, comparing tire placement with my original ladder. It’s 1″ tubing, 1/8″ wall thickness, 6061 aluminum. 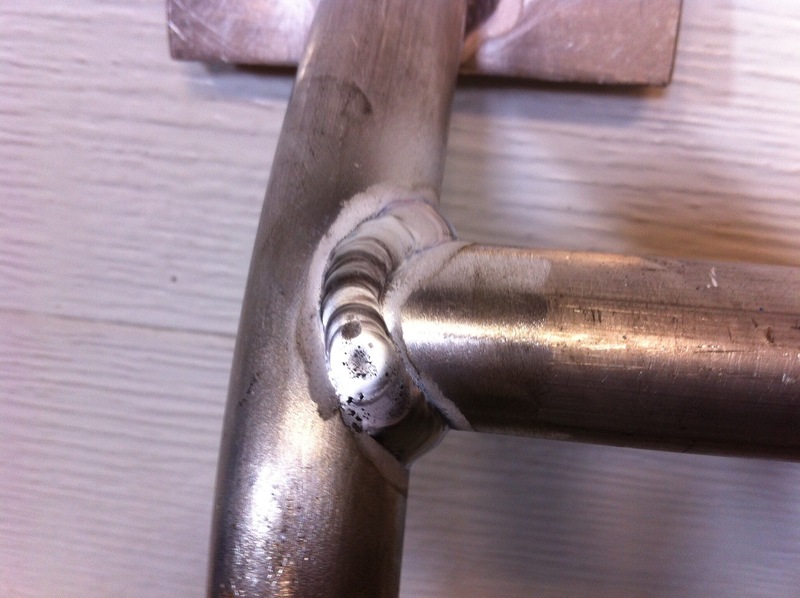 Joints coped and tig welded. On Simon’s van. The stainless steel hangers and bottom grabbers have been painted, but the ladder itself untouched. Simon is going to paint it later. It still works as a ladder with the tire on. Step up from the RMW bumper onto the tire. 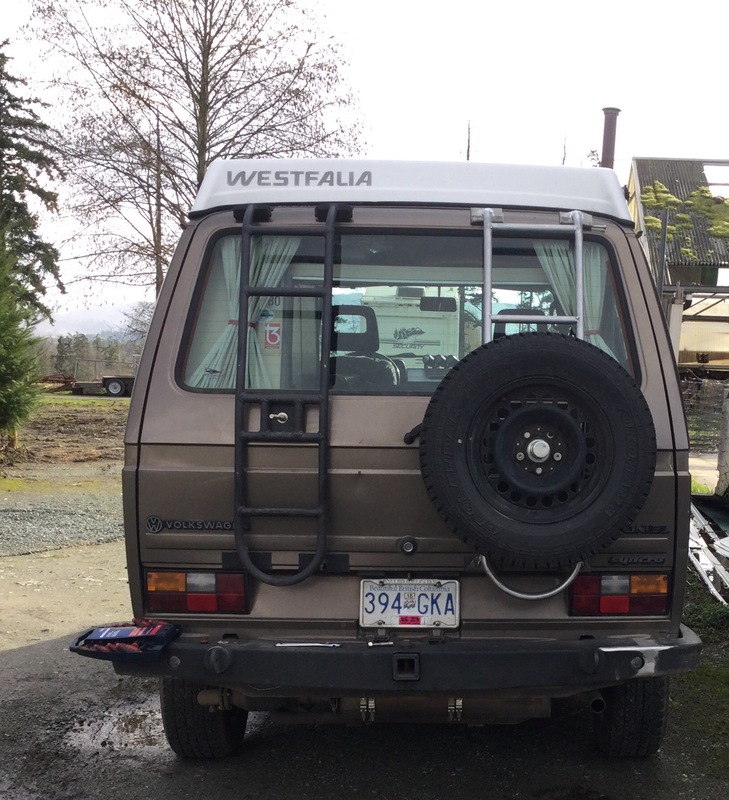 This entry was posted on March 6, 2016, 5:59 pm and is filed under syncro, vanagon, vanagon mods. You can follow any responses to this entry through RSS 2.0. You can leave a response, or trackback from your own site. looks good any for sale? Yes I’m going to make more of them. I’m going to change some things to make the design cleaner and to be frank, easier to make. If I was a more ambitious person I would be over confidant about costs and markets. But I’m pretty conservative and I seem to go in small steps. My dream, or fantasy set up would be making them to order and incorporating customer suggestions. But the problem with that is I would be working for minimum wage as no one really wants to pay for custom. I exaggerate but you know what I mean. The hard part is ahead of me. That is being able to make them with a decent profit and sell them for a decent price. I will advertise them in my blog when I get that part done. And I really appreciate any suggestions. Despite what Simon thinks when he suggests things to me, I do take the suggestions seriously. Loving the ladder by the way. Really a great tire-carrier-plus-general-utility solution (as long as you’ve got the struts to make it work). No propane dryer. I’m suggesting a clothes line. This ladder/tire holder is a fantastic design. I would love to buy one from you. If you are indeed open to suggestions, building one that can acommodate a rotopax or two, or perhaps a gas can, would be downright ideal for my needs. Love your blog, great work! Thanks for the compliments. I’ve though about how to add carrying capacity. One thing to consider is total weight. I wouldn’t want to hang too much there. I don’t have a firm idea of max weight but guessing no more than 60lbs. It’s not the static weight I worry about, it’s the dynamic loading when going over rough terrain. If you didn’t have the tire carrier then you have a good bit of useable area. I’m planning on making the ladder without the tire carrier, working on a removable tire carrier too. 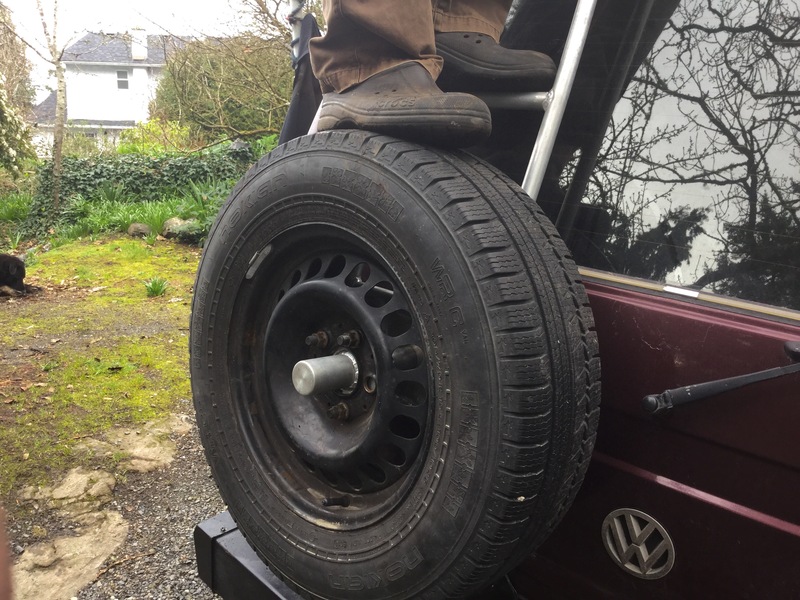 If that works out then a plain old ladder would be the basic model and you could add the tire carrier as an option. I’m looking into some attachment points, bosses, to make it easier to attach other stuff. Maybe even a shelf. Awesome, can’t wait to hear the progress. I would love to buy one from you. It might work out that some will be for sale. Early days yet, but I will post something about it. Awesome! Please keep me posted. Would be most interested in hearing an update on the bottom mount too. I think you mentioned in another comment you were still trying to optimize that because it had become loose before and even caused some damage. If you can figure that out, then I would love to buy one. I was considering buying a rocky mountain swing away but I like your model more. The ability to just pop the hatch without unlocking a swing away is a nice plus. Also, potentially using the step above the tire to access the roof (or maybe attach some rotopax jugs if that is possible?) is great. Anyway, look forward to hearing from you and well done on a very good looking rack! Thanks for the compliments. Yeah, the bottom attachment is or was the difficult part for me. I ve a good working solution, it holds tight and doesn’t seem to be damaging the hatch. But I’m really very conservative about these type of things and I can’t be 100% certain that it’s the perfect grabber. 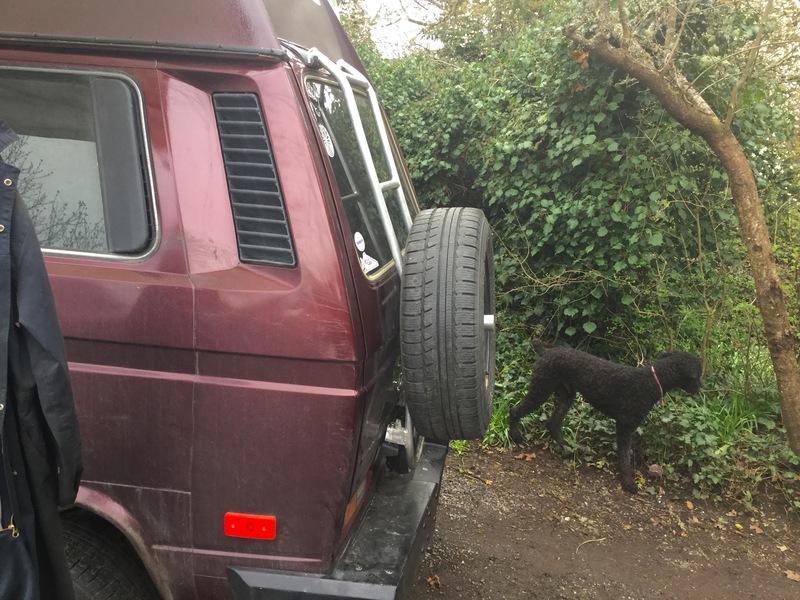 Simon is using his after I had it in my van for a week or so. He will sure let me know if there are any problems. I’m also making two more prototypes (spoken for) and having them out there and in use will be more good real life testing. You understand it’s one thing to make something for you’re own use, and a completely different thing to make something for someone else. Hey Alistair. Any progress with working on more rear tire carriers? I’m still interested in buying one! Thanks! As a matter of fact yes. Got one on the go right now. I’m still trying out ideas, this one has more rungs (7), and the tire carrier part is removable. It’s welded up, just have to get the attachment parts finished. Next day or so, and I’ll post pics and talk about making more, whether the design changes work, etc. I really like your ladder design, particularly the bottom attachments. Can you post a detail photo? I’ve been using my Paulchen rack as a gas can/firewood carrier but with a bit of weight on it the bottom attachments come loose and the rack shifts about. I’m looking for a better way to attach it. Also, how far did you get with oversize carrier for the stock position? I was thinking of doing something similar, but since I have no facilities for fabricating, just getting the Van Cafe or FAS carrier and maybe attaching the clam shell to it as a skid plate, with quick release clamps so it can be removed and used as a fire pit. I’m happy about how the bottom grabbers work, but I’m reluctiant to post details until I’m sure of it by doing a few more. I hope you’ll understand this, I’m not meaning to be rude. I have had problems with the paulchen loosening up and I have had problems with it denting the hatch metal when I tightest down hard to make it secure. That’s why I have tried to get a better bottom of the hatch clamping method. Up at the front the skid plate/carrier carries my auxiallry battery and I don’t think the design allows enough room to carry a tire instead of battery. No worries and thanks for the info. I thought I’d found a really good solution with the Paulchen but that bottom attachment is a problem. I’ve seen others just bolt it to their hatch but I don’t want to do that. Looking forward to seeing more of your work!